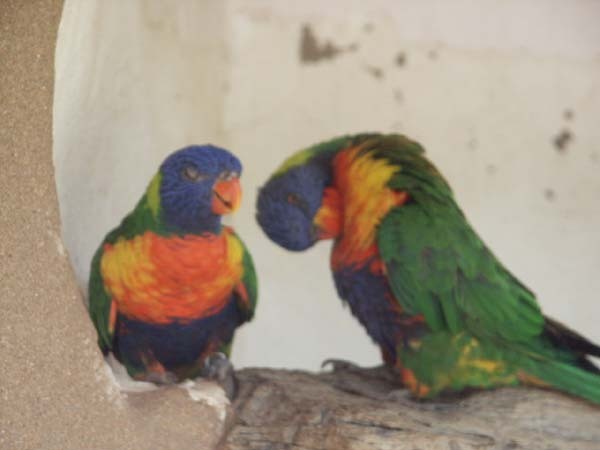 Lorikeets are among the most colourful, active and entertaining aviary birds it is possible to keep. In this article I will discuss the species likely to be available in the UK. Ten or 20 years ago the choice was much wider. Since then many lories, including breeding pairs, have been exported, so today the choice is greatly diminished, as is the ease of acquiring them. 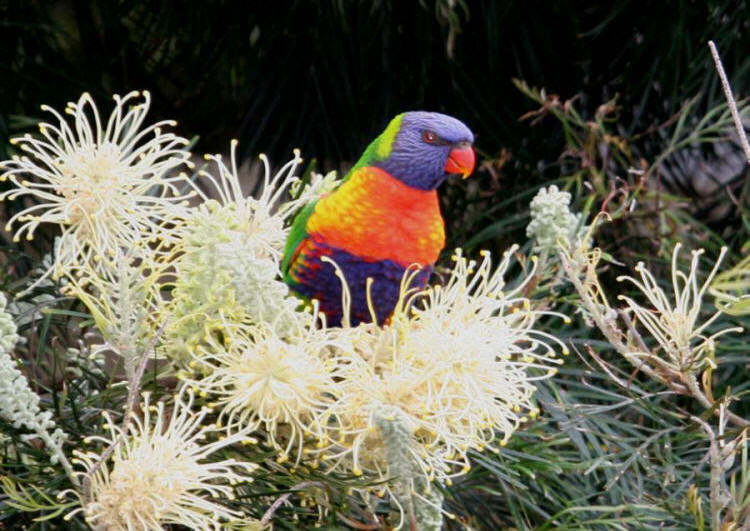 and the Swainson’s or Rainbow Lorikeet (T.h.moluccanus). Their care does not differ. to take nectar from tiny cups. 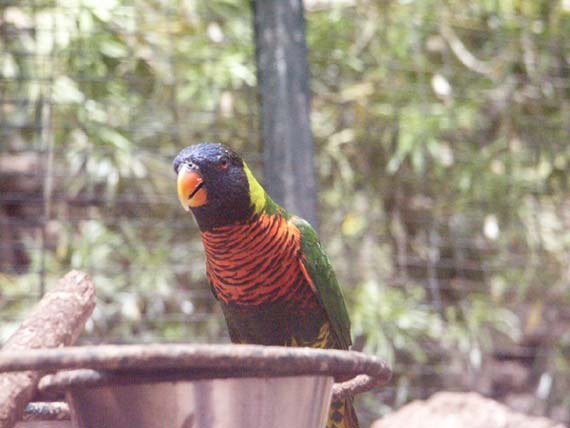 (or better still, Jurong Bird Park in Singapore which has the world’s biggest lory exhibit). It can be difficult to identify some of these as the differences are so subtle. the Swainson’s being the largest. is found only in Australia. 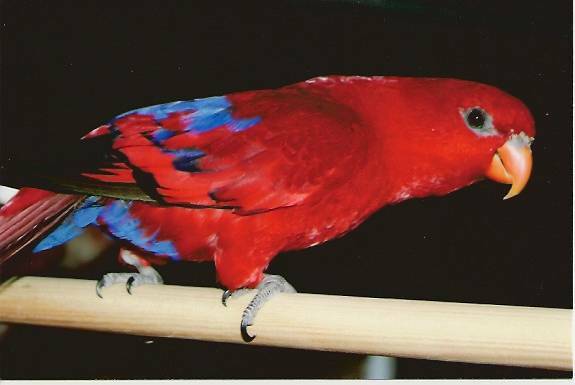 Many people have seen film of these birds at Currumbin Sanctuary in Queensland. one of the most vivid spectacles on earth. members of the public taking sick wild birds to them. This underlines the importance of correct feeding of birds rearing young. 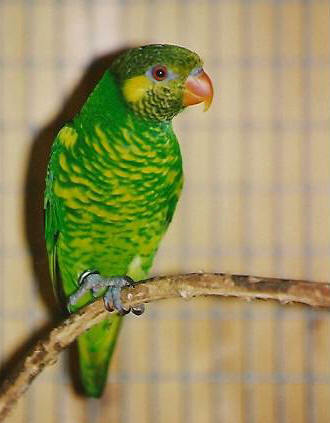 Three small lorikeets are sometimes offered for sale. with a body size no larger than an exhibition Budgerigar. but Goldie’s and Meyer’s can be kept and bred in cages only 6ft (1.8m) long. They are also among the quietest of the lorikeets. 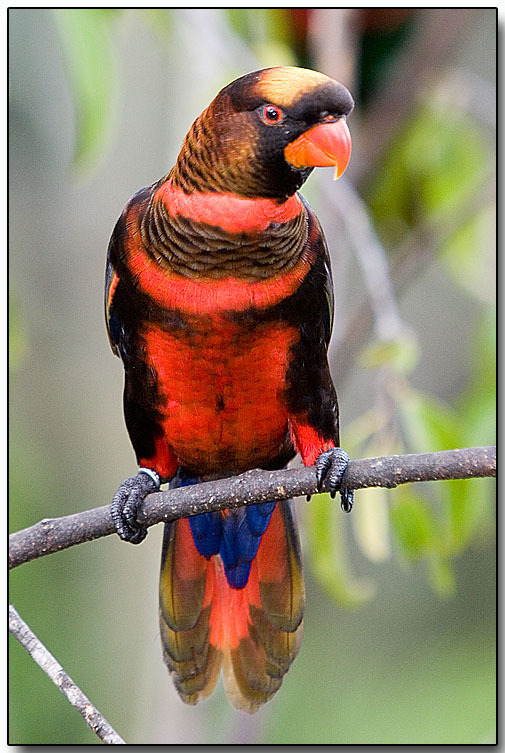 – more soberly coloured than most lorikeets but very prettily marked with pleasing personalities. They warble and chatter in a way that is reminiscent of Budgerigars. Although Iris Lories are small, they need a flight at least 10ft (3m) long and really enjoy a 15ft (4.5m) aviary. They are a little noisier than the other two small species but are very beautiful with outgoing personalities. are the shyest of the group and like to hide away in lots of leafy branches. As with the Meyer’s and the Iris, they lay two eggs, incubated by the female for about 23 days. Young spend about eight weeks in the nest. On fledging their plumage is duller with dull plum colour rather than scarlet on the head. – in fact they are wrongly classified in this genus. They tend to move about in a cautious manner, with the head held low, almost horizontal to the body. Leafy branches in which to climb and hide will greatly enhance their environment. This is, of course, true for all lorikeets but none more so than Goldie’s. and also consume such fruits as apple, pear, grapes, oranges and Satsumas, and pomegranate. that they might cease to brood the chicks when these are aged between 10 and 14 days. Even during our so-called summer this could lead to the death of young chicks. For this reason a brooder should be kept running and nest inspection should be made early every morning. or removed for hand-rearing in the colder months. Once a chick becomes cold it does not cry for food and will not be fed. Hunger and cold will kill it, especially if it is a single chick. Problems are most likely to arise if the nest litter is not changed regularly and becomes damp. although this can be difficult with some aggressive lories. then from inside the nest I stuff a towel in the nest entrance. are recognised by their basically red plumage. These lories are wonderfully entertaining aviary birds. They are active and playful and need a flight at least 12ft (3.6m) long and a minimum of 3ft (91cm) wide. and is best placed in the shelter or indoor part during the winter months. Hardy birds, they do not need heated accommodation. but being such active birds they do best in an aviary. The protein content of the diet should, perhaps, be slightly higher than that of most other lories. This can be achieved with the use of a little soaked or sprouted sunflower seed. an egg-rearing food or a food mixed with chopped fruit. Those who use cooked beans and pulses for other birds, can offer some to the lories as well. The numbers of these lories in the wild have declined due to over-trapping. in some areas, to deforestation. But the EC has rightly prohibited their importation into Europe. The effect of this prohibition is now apparent. 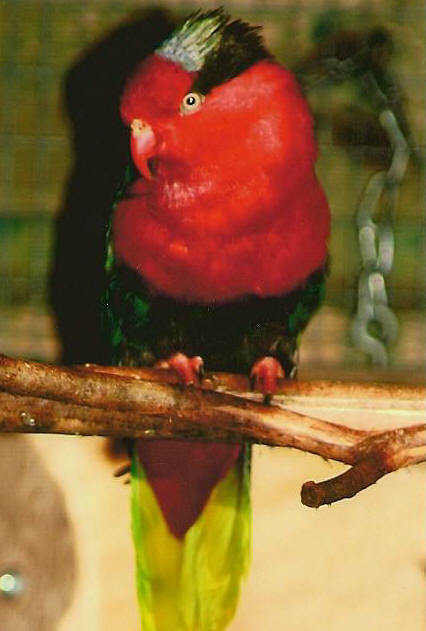 Red Lories are no longer common and the Violet-necked has almost disappeared in the UK. if we are not to lose them altogether. They are greatly undervalued, in financial and aesthetic terms. with a long history in aviculture. It occurs on Seram and some of the smaller Moluccan islands. by the darker shade of red. some birds have blue on the ear coverts and blue margins to the feathers of the underparts. Beak and iris are brown when young birds leave the nest; this colour is quickly lost. To see them in display is unforgettable. Both sexes will strut along the perch, arching the neck, hissing and nuzzling each other’s faces. The male especially stretching to his full height. This species comes from the Tanimbar Islands, east of Timor and south of Seram. is from the island of Biak. have been almost totally cleared of primary forest. are the smallest members of the genus at 10in (26cm) and 9in (23cm). was unknown in aviculture until 1987. Few were imported into the UK and few were bred. An effort should be made to find odd birds and pair them up. are usually easy to breed. 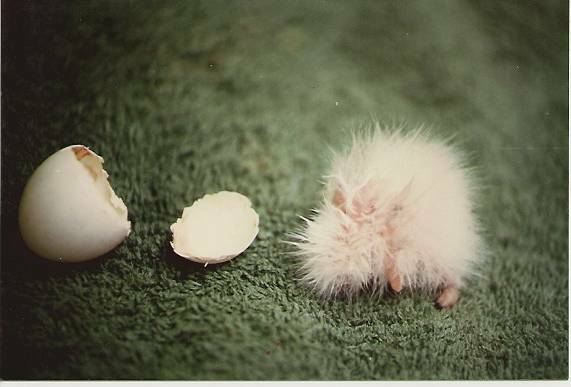 Two eggs are laid and incubated by the female for 24 or 25 days. Young spend about ten weeks in the nest. but young feather up quickly after fledging. are now represented in UK aviculture mainly by the Black-cap and the Yellow-bib. 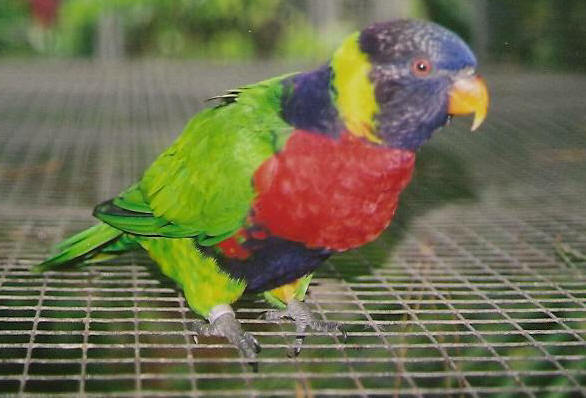 The Black-cap (Lorius lory) breeds well and young are sometimes available. It is a wonderful aviary bird but it must be admitted that its voice is loud. As aviary birds they often become tame. They have great character and their display is amusing to watch. The red-breasted form, erythrothorax, is the only sub-species readily available here now. The nominate race has black almost up to the throat and right round to the nape. Producing hybrids from these two or any other sub-species must be avoided. is, sadly, a bird which has been endangered by trade. Few birds are exported because they are eagerly sought as pets on the island of Seram. and Buru (probably escaped pet birds). 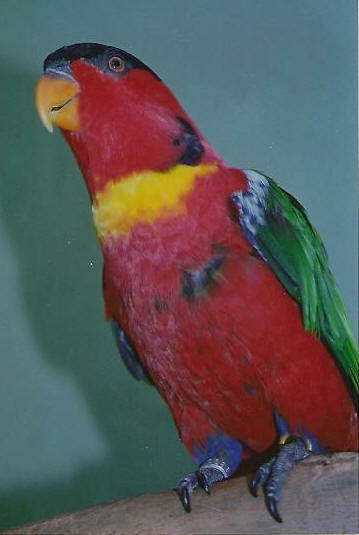 Worldwide numbers of Purple-naped lories in aviculture are low and the breeding success rate is poor. There are literally only one or two breeders in the UK. Young birds have less yellow on the "bib" but the black patch on the side of the neck is present. Found only in the Solomon Islands. 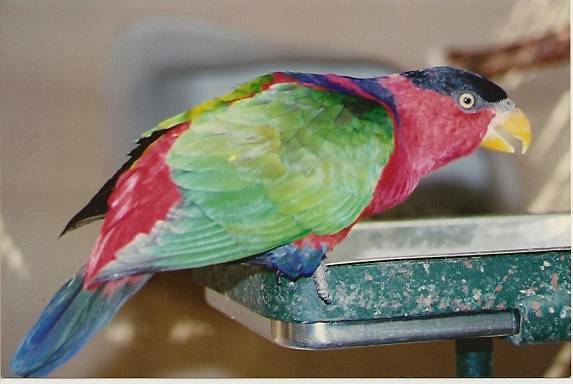 This lory was almost unknown in aviculture until 1991 when its export was permitted for the first time. and its sub-species the Yellow-backed (L.g.flavopalliatus). The latter was formerly kept and bred in larger numbers in the UK than any other member of the genus. It is admired for its gorgeous plumage and appealing personality. A few are kept as pets and, like the Black-cap, some are excellent mimics. This species originates from the northern Moluccan islands of Indonesia. It is declining due to deforestation and trapping. which are incubated for 25 or 26 days by the female. The young spend between ten and 11 weeks in the nest. Surgical sexing is more risky for lories than for other parrots. A word of warning about Lorius species. They can never, ever be trusted with other birds in an aviary or pet situation. An aviary for these lories should be about 15ft (4.5m) long. If they lack exercise, they can become overweight. In any case, it is good to see them flying. indeed, for most of that time they have outnumbered other parrot species in my aviaries. 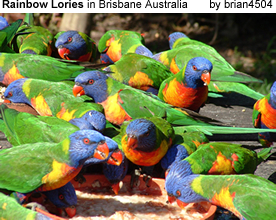 In this article I use the term "lory" to include lorikeets as well. and those of their own kind. usually locked in a friendly tussle with a companion or sibling. I never tire of watching them at play. Unlike other birds, this usually means testing with the tongue. but this is probably at its height in Chalcopsitta species, especially the Black. It is touching to watch the affection of which they are capable. – and there are 53 species! However, only a small number are well known in aviculture. I will generalise on their "good and bad points" and mention their advantages and disadvantages. They are great fun to keep because they are so playful and active. They don’t sit around most of the day doing nothing! They are also inventive in their play. They are so beautiful and brightly coloured – a delight to the eye. They breed with relative ease. Most of the larger species are noisy and some have piercing calls. They are extremely aggressive towards other birds. (I would consider this to be desirable, whatever species one keeps). 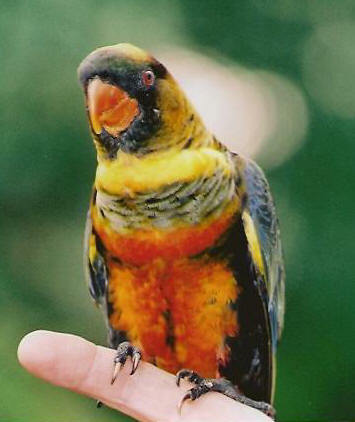 In the UK (unlike in the USA, for example) few lories and lorikeets are kept as pets. 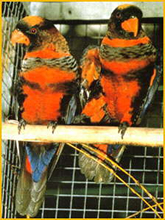 They are usually favoured by breeders and kept in pairs in outdoor aviaries. if they will thenceforth be isolated from their other lories. 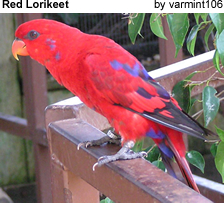 Lories and lorikeets might breed at any time of the year. Many chicks hatched during the coldest months die at about the age of ten days. It is therefore advisable to remove them for hand-rearing. all they want is human companionship. Such birds can make fantastic pets. enable them to collect pollen and nectar from blossoms. The tip of the tongue contains tiny brushes or papillae. These are developed to a varying degree according to the species and its environment. they attain maximum development and the tongue is longer than in other species. (perhaps to clean the beak). which is among the more omnivorous species. The brushes on the tongue are the least developed in the Iris and Musschenbroek’s Lorikeets. which it perhaps uses to extract grubs from beneath tree bark. Mine are passionately fond of wax moth larvae, some of which they receive daily. In all species the papillae are contained within small sheaths. These are unfurled only when the bird is feeding or exploring with its tongue. At other times the tongue looks like that of other parrots. so you can easily examine the tongue. to which you add water. As in any range of products these vary in quality. 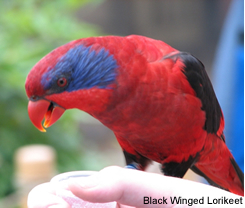 a particular lory food cannot suit all species of lories. because they consume a wide variety of other foods. If they do not look well and/or they are not breeding, change the brand of nectar. It is difficult for most people to know if a nectar food is well formulated. such as maize and wheat and avoid one that is excessively sweet. It should taste pleasant and a little sweet. In my opinion most manufacturers give instructions that make up the nectar too thick. Among the most sensitive species are the little Whiskered Lorikeets. They like nectar well diluted, not thick. Nekton’s Nektar-Plus or a sunbird nectar is most suitable for them. I make up my own nectar. as it can be difficult to find malt extract. and enough hot water to make up one litre, to serve warm. You need to keep stirring when serving to prevent the CéDé from settling on the bottom of the jug. In my opinion Lory CéDé makes up too thick if used alone. The analysis of this food is 15.7% crude protein, 3.5% crude fat, 67% carbohydrate and 1% calcium. as lories do not like drinking from deep containers. as most kinds of nectar settle after a while, leaving water on the top. perhaps using one type in the morning and another in the afternoon or evening. I often offer Nekton-Lori in the evening and always give it to pairs rearing young. The universal favourite fruit of lories is the pomegranate. apple, pear, grapes, orange (especially sweet Satsumas), banana and kiwi. Papaya, cactus fruits and guavas are also relished. Some lories will eat other fruits, such as mangoes and strawberries. Dried sultanas which have been soaked in water overnight until pump are a great favourite. My birds also like dried figs that have been soaked. Fruit is best cut into small pieces and offered in a separate stainless steel container. Alternatively, it can be spiked on to a stainless steel holder. Some lory keepers liquidise fruit and add it to the nectar. However, unless it will all be eaten in a couple of hours this might not be a good idea in warm weather. All lories should be fed in the inside part of the aviary. as they fill the nectar pots of lories kept outdoors. In winter the nectar can freeze outdoors. and this would be especially important for those kept outdoors where the nectar can freeze. Frozen, thawed sweetcorn is a favourite with all my lories. these are pushed through the welded mesh. Cooked red bell pepper is eagerly eaten by one of my Iris. Only a few lorikeets, notably Stella’s and Whiskered, like green leaves. Swiss chard, spinach, chickweed, sowthistle and young dandelion leaves are the most suitable. to play with and to take the pollen. These include apple and elder blossom, flowering heads of dandelion and flowers of hibiscus and nasturtiums. 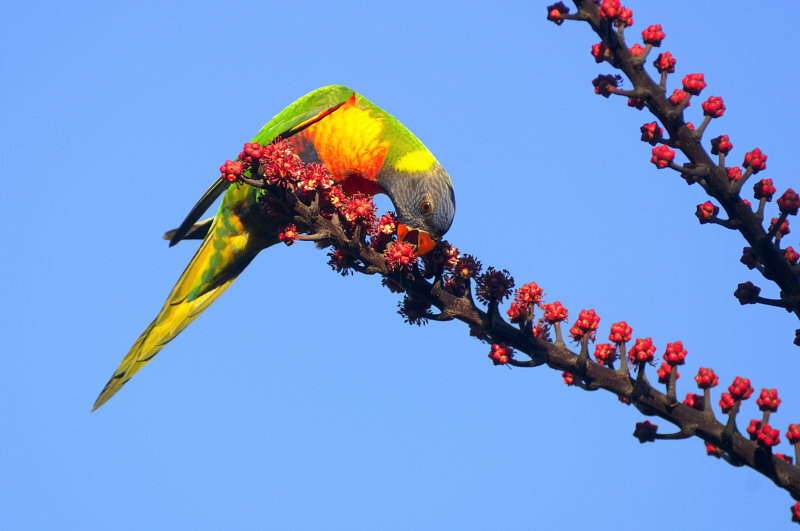 In the wild many lorikeets eat green seeds. 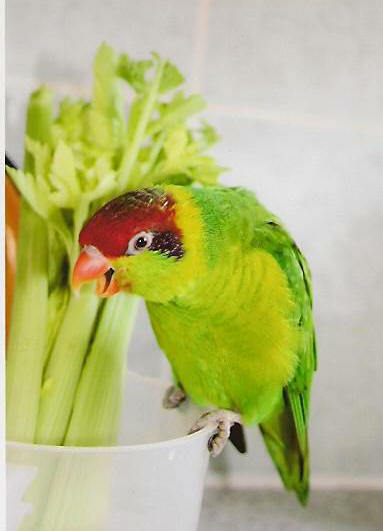 In captivity Trichoglossus lorikeets like spray millet. Small striped sunflower seed – preferably soaked – can be offered when they are rearing young. but this should be limited. one would give to seed-eating parrots. and liquid food goes through them very quickly. The small species need to have nectar in front of them at all times. and might not even be recognised as food. So, you might unintentially be "starving" your bird by offering this dried foods! !